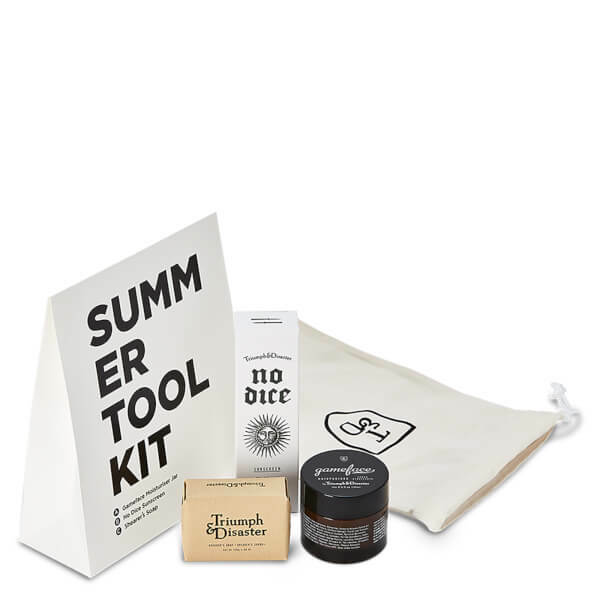 Stay safe, fresh and clean with Triumph & Disaster Summer Tool Kit; a skincare trio that will leave you looking and feeling revitalised. Complete with a drawstring T&D bag. A high protection facial sun lotion that expertly shields skin from the sun without causing greasiness or staining clothes. An 87% natural formulation with Zinc and Titanium Oxide for natural sun protection, and Green Tea and Jojoba Esters for antioxidant, moisturising properties, the sun lotion effectively protects and reinforces skin. Its non-whitening, quick absorbing texture melts comfortable into skin without a trace, delivering premium protection that won't irritate or clog your pores. A cleansing soap bar made from a translucent base high in Glycerin, which makes it incredibly gentle on the skin. Enriched with Poppy Seeds to assist exfoliation and provide a massaging effect for an invigorating bathing experience. Safe for the environment, delicate on the skin and a treat for the senses. Use daily for a superb all over body exfoliation. A lightweight emulsion that works to intensely hydrate skin whilst reinforcing its protective barrier. Non-greasy and quick absorbing, the unique formulation delivers a veil of comfort over skin; its blend of Vitamin E, Jojoba Extract, antioxidant Horopito Oil and anti-ageing Ponga Fern work in synergy to effectively moisturise while performing a natural toning, tightening effect on skin. Infused with essential oils to form the brand's 'smoke and wood' fragrance. Protector solar: Aplicar generosamente 15 minutos antes de la exposición al sol. Repetir la aplicación después de nadar o cada dos horas. Jabón: Utilizar a diario en la ducha para limpiar la piel. Hidratante: Aplicar por la mañana y por la noche sobre el rostro seco después de limpiar. Sunscreen: Aqua (Water), Propylene Glycol, Ethylhexyl Methoxycrylene, Zinc Oxide & Caprylic/Capric Triglyceride & Polyhydroxystearic Acid & Isostearic Acid, Cetearyl Alcohol & PEG-20 Stearate, Polysorbate 60, Stearic Acid, Betaine, Camellia Sinensis (Green Tea) Extract, Glycerine, Cetyl Alcohol, Titanium Dioxide, Cyclotetrasiloxane & Cyclopentasiloxane, Dimethicone, Benzyl Alcohol, Salicylic Acid, Caprylyl Glycol, Sorbic Acid, Hydrolyzed Jojoba Esters, Panthenol (Pro-Vitamin B5), Tocopheryl Acetate (Vitamin E), Natural Fragrance, Triethanolamine, Carbomer. Soap: Sodium Palmate, Sodium Palm Kernelate, Glycerin, Aqua (Water), Parfum (Natural Fragrance), Papaver Somniferum Seed (Poppy Seed), Sodium Chloride (Salt), CI 77491 (Brown Oxide), CI 77499 (Black Oxide), Tetrasodium EDTA, Tetrasodium Etidronate, †Linalool, †d-Limonene. (†Component of Natural Fragrance).